Frühlingsfest des Interkulturellen Gartens	— 08.05. 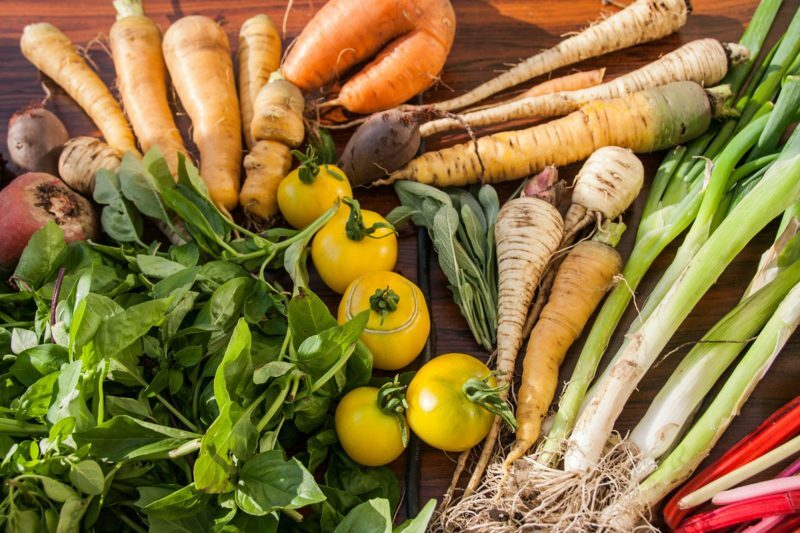 Although the species and specific techniques vary, cultivating vegetables is a worldwide pastime. This common ground enables gardeners to communicate despite language barriers—and help break down these barriers. 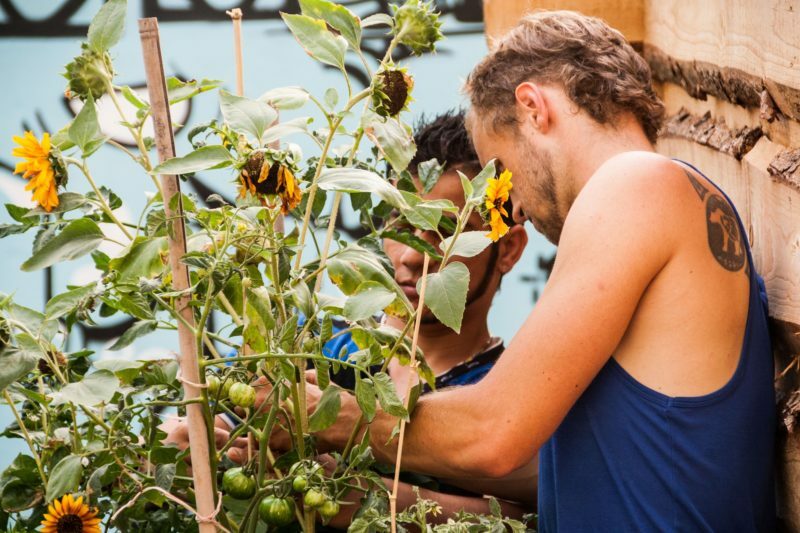 Gardeners from Germany and abroad can exchange regional and cultural customs related to the cultivation and consumption of produce, allowing them to learn with and from one another. 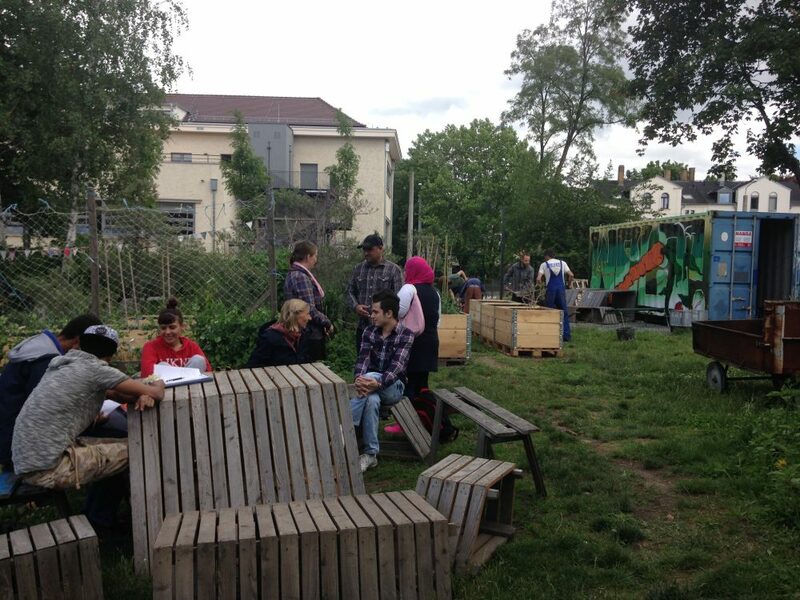 The core goal of this project is to create a participatory, self-organized intercultural garden. 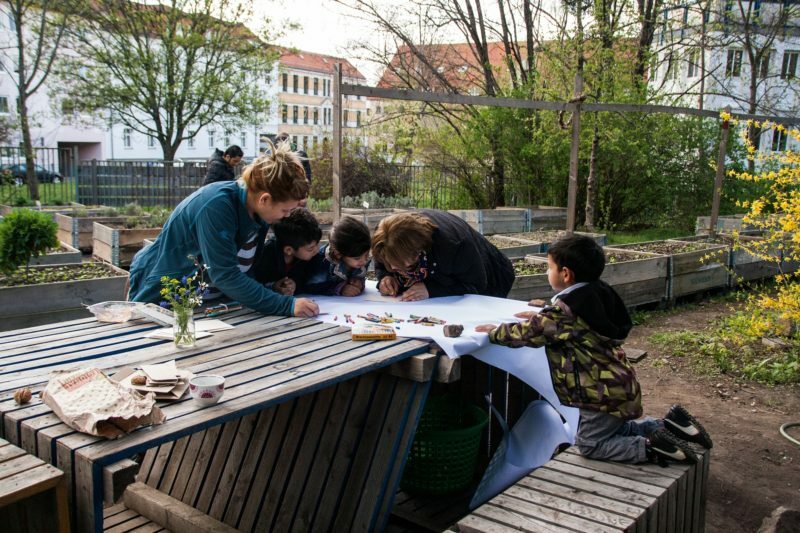 This garden will function as an adaptable, accessible platform for learning—for basic everyday life skills as well as for intercultural competence. 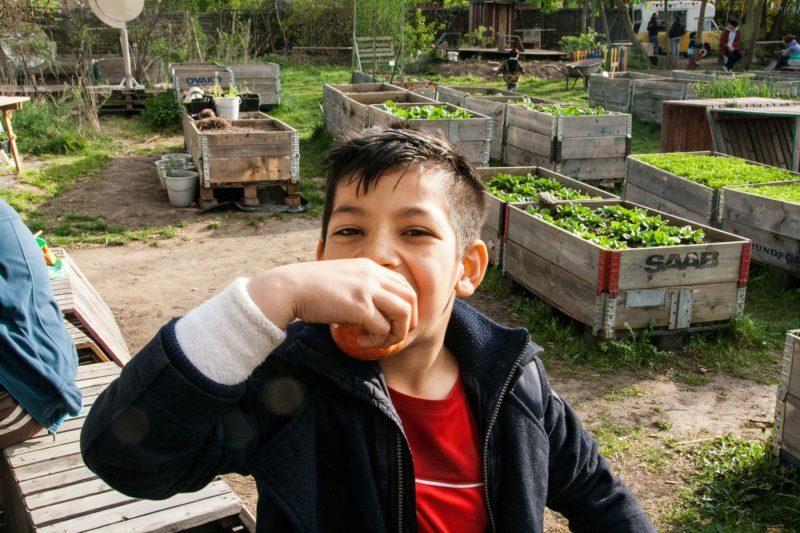 Within in the framework of the ESF project „intercultural garden“ we meet weekly in the ANNALINDE community garden with citizens of the district, with and without refuge- or migration biography, to plant, seed, moore beds, cultivate the garden, harvest vegetables and to serve up the fruits of our work. That’s how we gain ground under our feet and how we’re able to ground and root ourselves in the district „Leipziger Westen“. 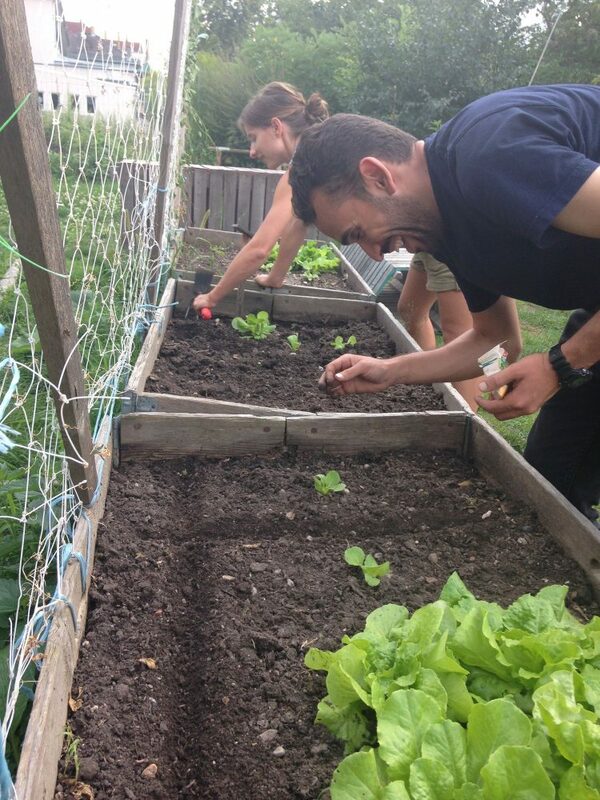 The community garden presents a sustainable and growing place for low-threshold learning of basic- and key competencies, to handle every day and intercultural communication autonomously. 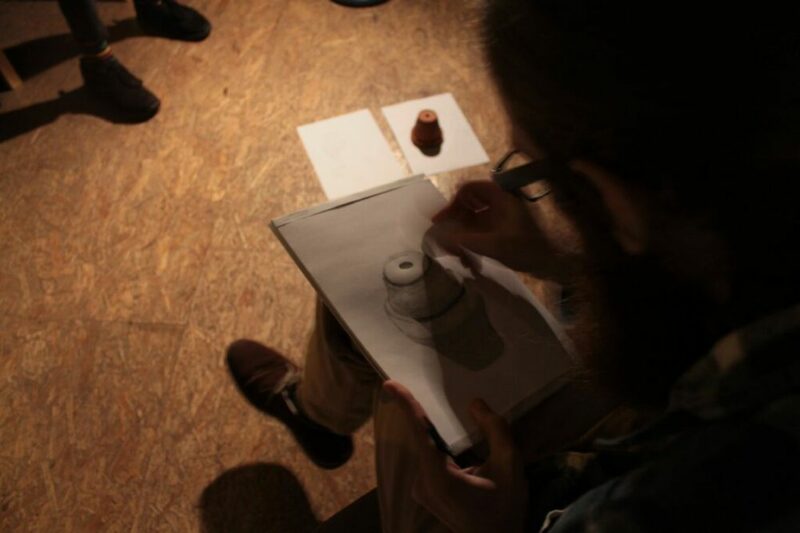 Furthermore, twice a month we discover with the gardener’s different sociocultural offerings of the development area, offer self-organized workshops or get cultural or artistic events going. 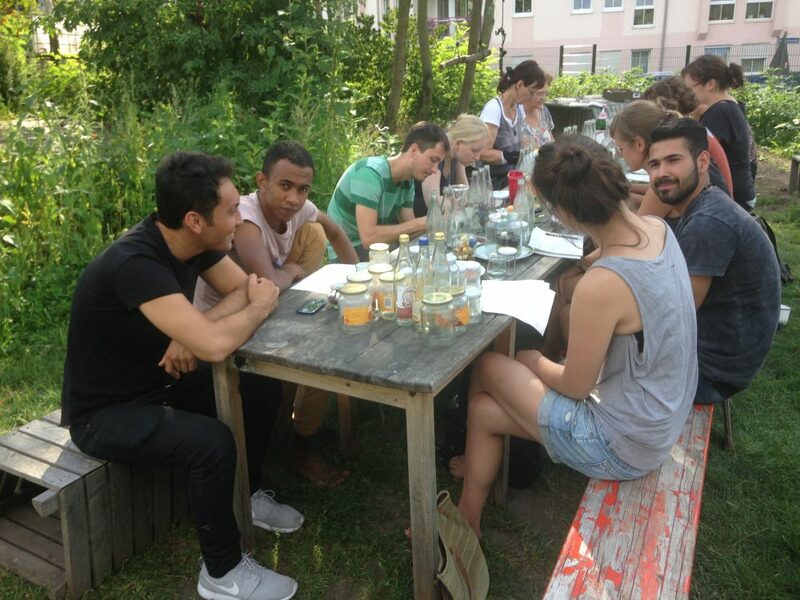 By discovering further initiatives, we want to create incentives to participate in sociocultural offerings in the west of Leipzig and to get to know places at which it is possible to cover different basic needs on a basis of the common good („Gemeinwohlökonomie“). In addition, the intercultural garden is a perfect place for meeting and communicating with support networks in the district, what helps to learn about one’s opportunities in learning languages and in professional orientation. Therefore, the intercultural garden helps to settle in the new home and to experience self-efficacy and purpose fomenting doing. Along with the annual project extension, there has been added a new project component in September 2018, the consultation hours „Unterstützungsnetzwerk“. 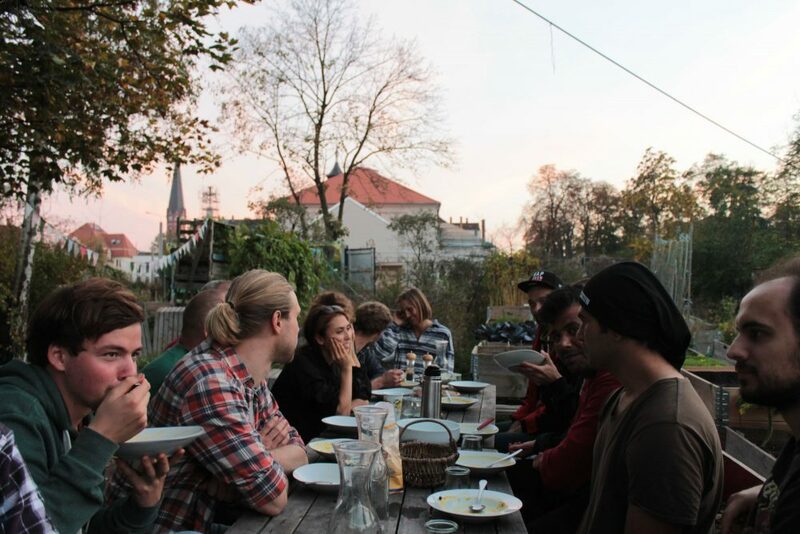 The idea behind: In the past few years many thematically diversified assistance initiatives and sociocultural contact points settled down in the development area in the west of Leipzig. But often they aren’t known or there are specific burdens to perceive their offers. We want to change that! Every second Thursday you are invited to visit us with all your questions about asylum, apartment search, language acquisition and we support you by for example taking a joint look on your forms or transmit you to an expert. 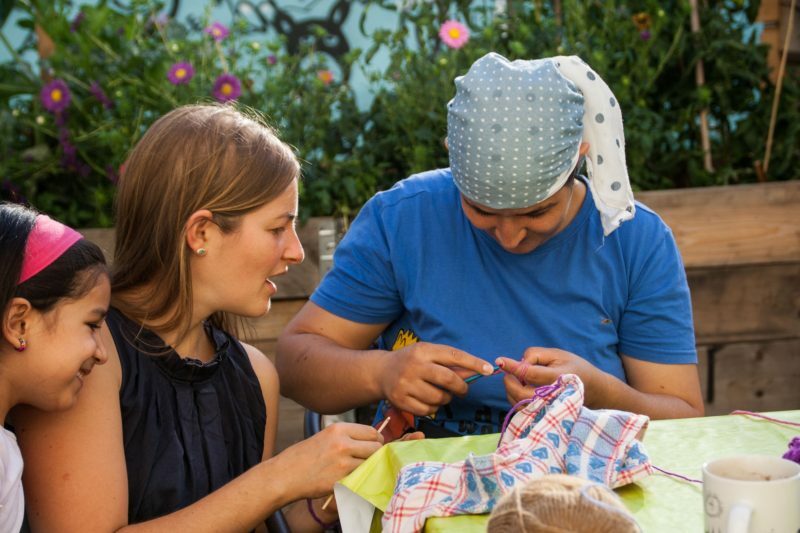 From April until October 2019 the intercultural garden takes place always Tuesdays 16:00-19:00 o’clock and Wednesdays 15:00-19:00 o’clock in the community garden. ATTENTION! From the 15. of November the winter meeting is taking place in the Georg-Schwarz-Straße 19. 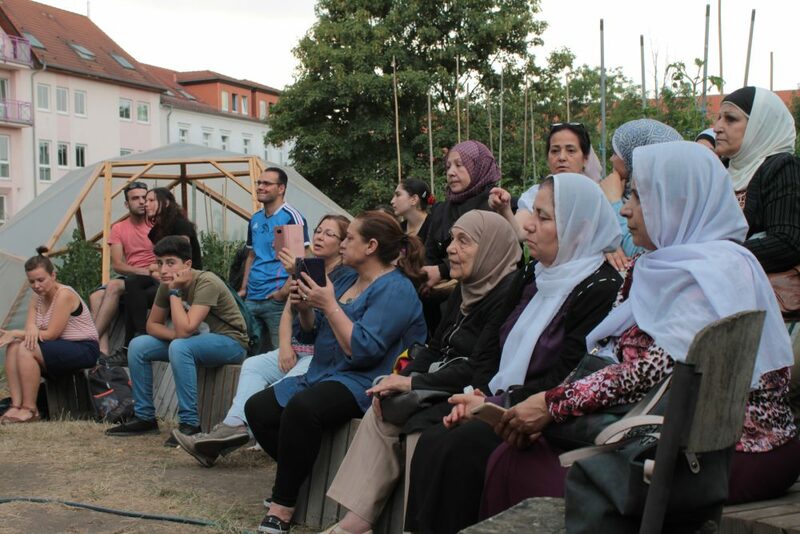 The project „intercultural garden“ is funded from September 2016 until August 2019 by the European Union with means of the ESF (European social fund). From the 15. of November the winter meeting is taking place. 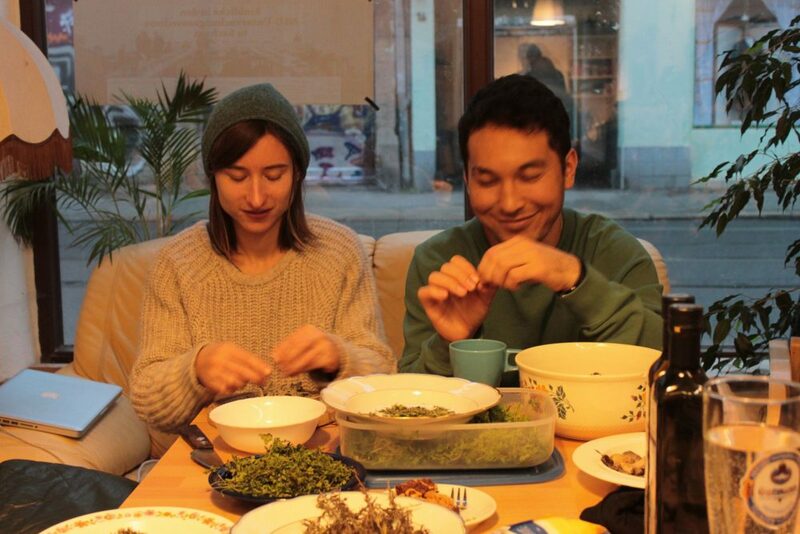 Also on Thursdays from 12:00-19:00 we’re meeting in the rooms of the Kontaktstelle Wohnen to cook together, arrange workshops and to stay in contact also in the cold months. Further information about events of the winter meeting you can find here. Place: Kontaktstelle Wohnen, Georg-Schwarz-Straße 19, 04177 Leipzig. 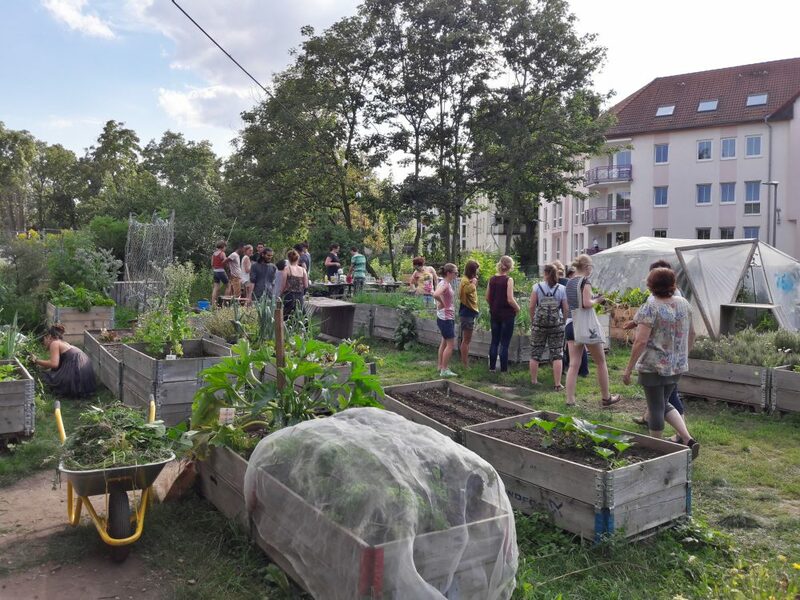 In the context of the event “Viva la Vielfalt,” the Community Garden became a place for regular meetings between garden volunteers and refugees from the “Pandechaion Herberge e.V.” accommodation. 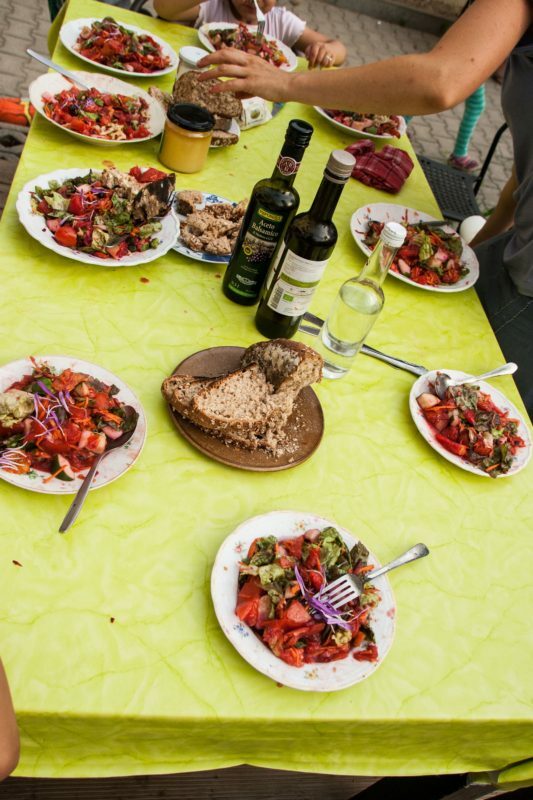 At the meetings, all participants gardened, harvested, cooked and ate together. This brought forth many positive encounters and an active intercultural exchange. The highlight of the event was a one-week photo exhibition, which documented participants’ impressions of the events. 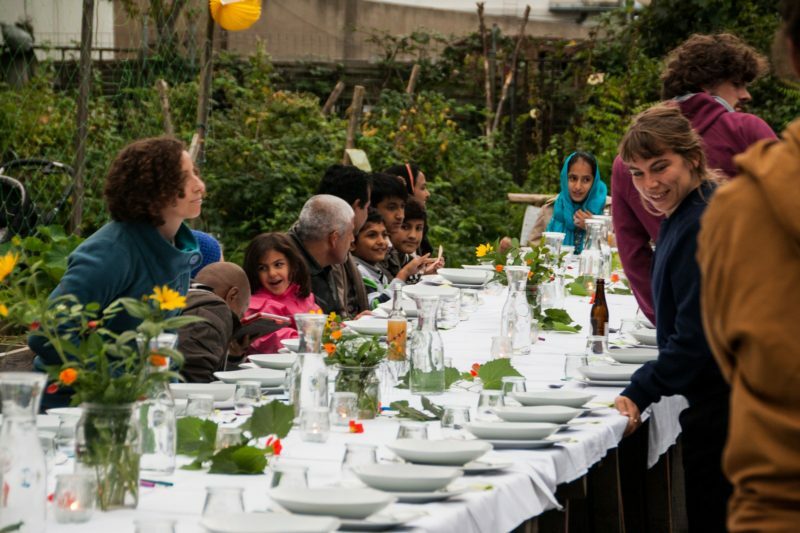 For the occasion, refugees and volunteers organised a dinner with performance elements—“Aufgetischt” [Served up]—together with the initiative interaction Leipzig e.V. 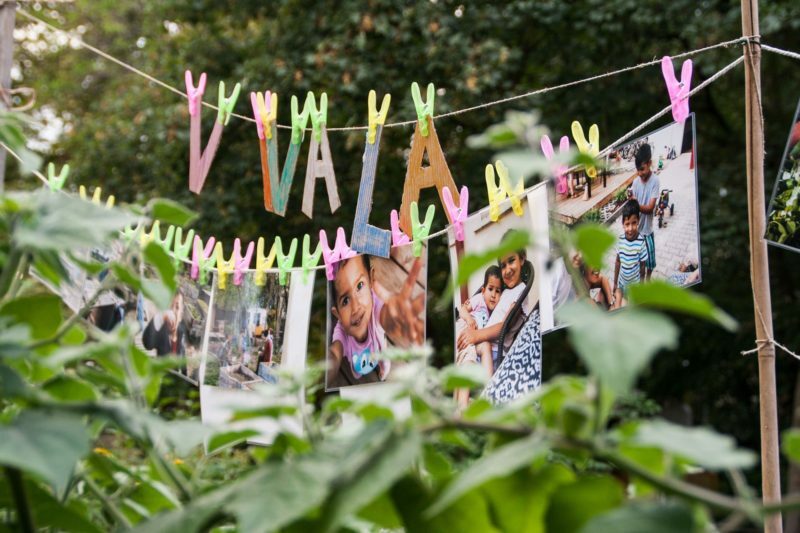 The experiences and ideas from the project “Viva la Vielfalt” laid the foundation for the European Social Forum’s concept of the “Intercultural Garden.” The project “Intercultural Garden” started in autumn 2016 in the „open garden west“ where a working group of Zollschuppen e.V. 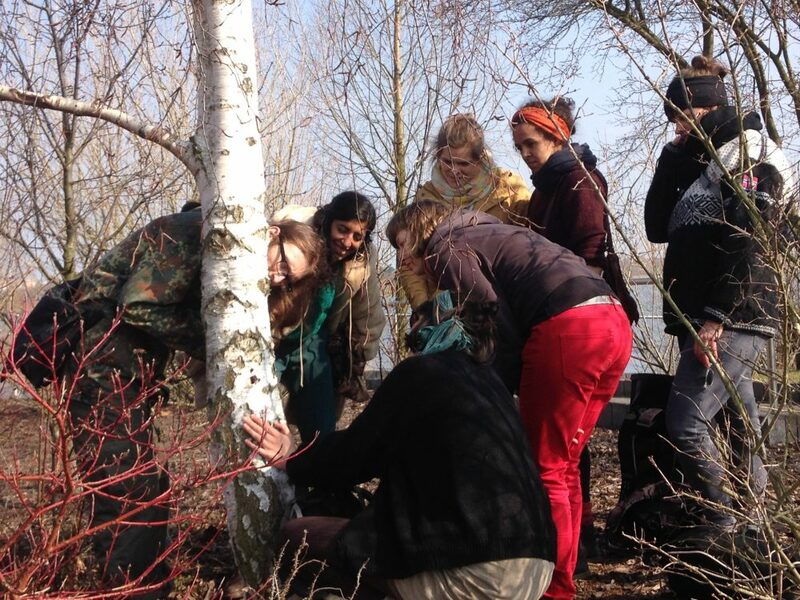 was already active in an intercultural garden project since the start of 2016. 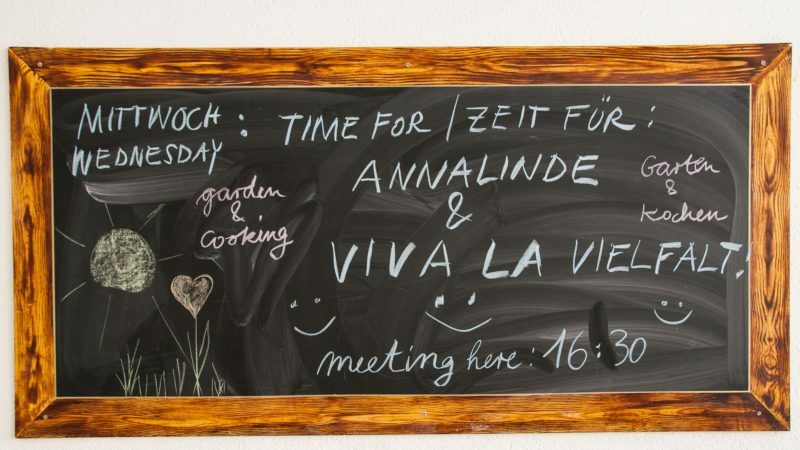 Joint with the consisting garden community we participated in the management and the design of the garden and organised a weekly garden coffee in winter in the venues of the Zollschuppen e.V.. There we backed, crafted, played games and music in the cold months. Due to a planned construction project, we couldn’t maintain the area of the open garden west as a garden area. As we want to provide our participants with a permanent perspective and a fixed place for the intercultural garden, we decided to move to the ANNALINDE community garden in the season 2017 where we entrenched ourselves. 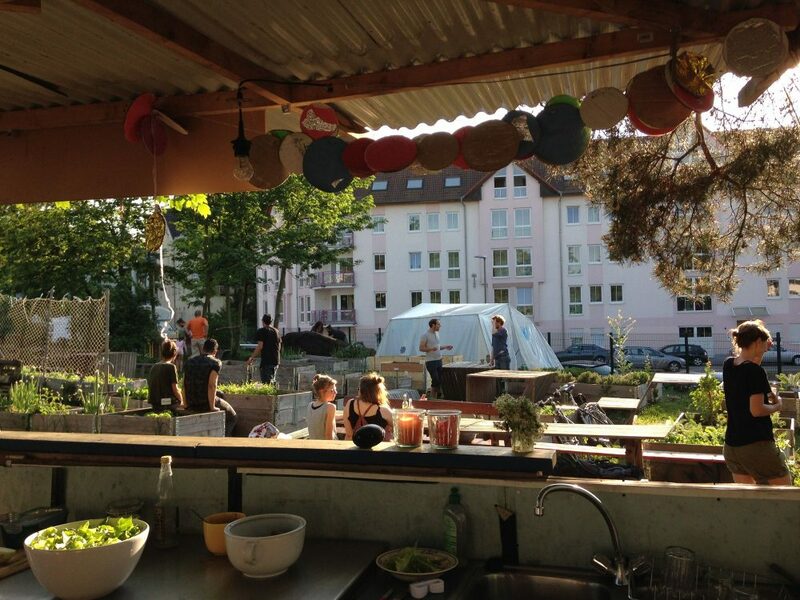 With the change of location to the Zschochersche Straße 12, we were able to fall back on well-established structures in the garden like the community kitchen, the over 50 raised beds, the greenhouse, a „perennial grown“ garden community and a multiple proven space for (cultural) events. 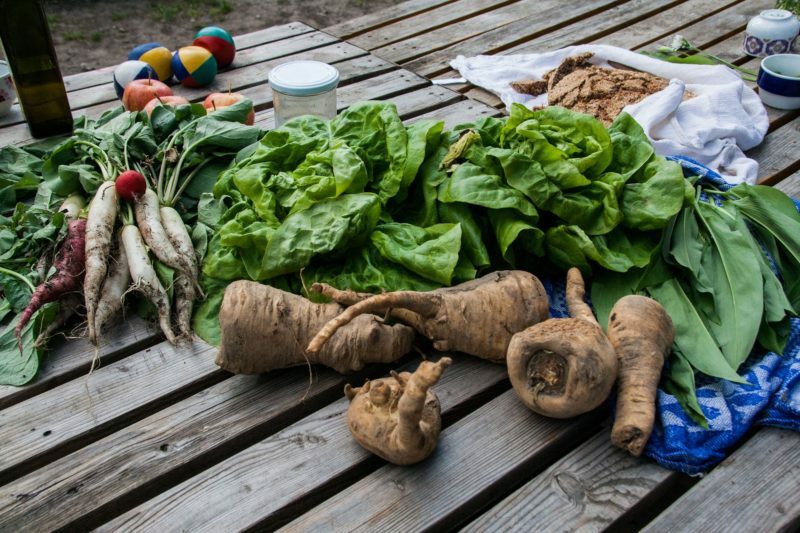 The ANNALINDE community garden helped us having an easy start into the new season. Numerous beds were renewed and planted, different elements in the community garden repaired or built and great festivals celebrated. 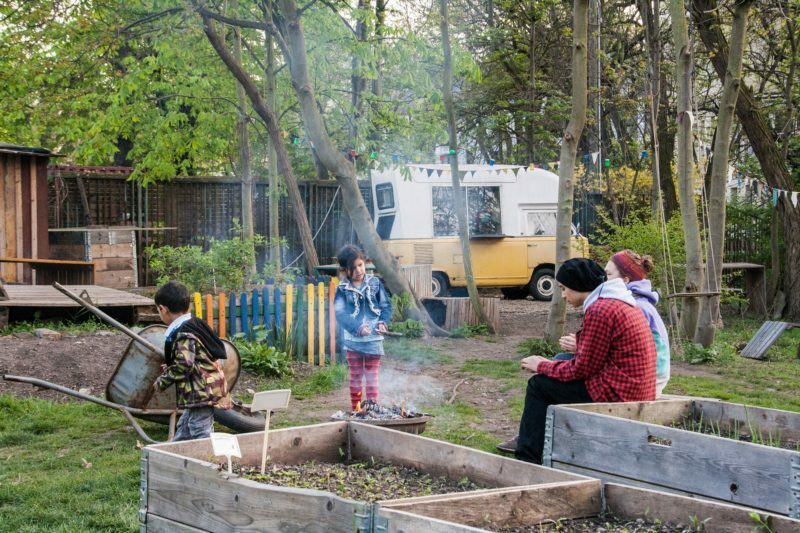 The summer kitchen turned into the key place of the intercultural garden and served numerous events with space- and development opportunities. 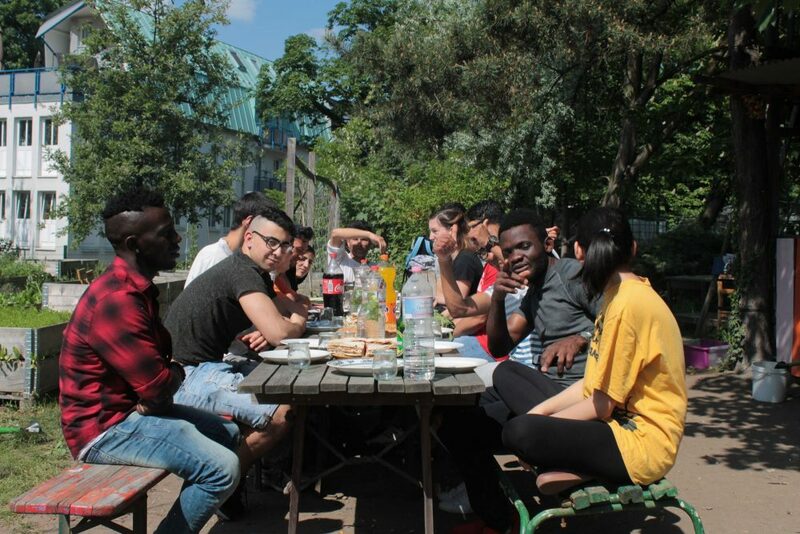 On this occasion, the ANNALINDE garden dinner, the Fête de la musique, the celebration of the „Eyt de Ramadan“ and the summer festival of the intercultural garden with the subsequent SeaNaps-Festival were highlights. 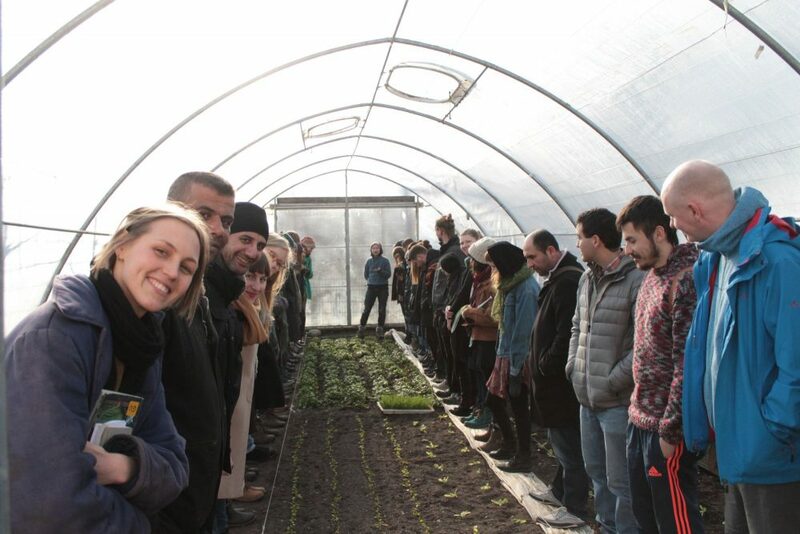 Joint, we were able to acquire much knowledge during the activities and learned for example about the different forms of cultivation, various plant groups and the principle of crop rotation. 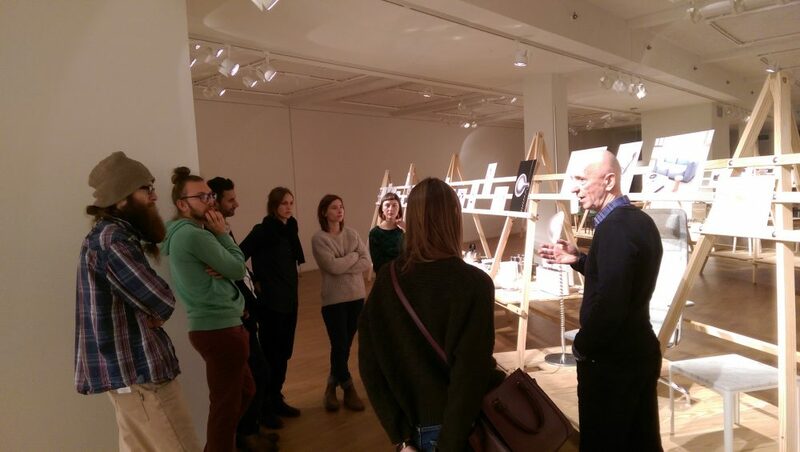 The winter meeting happened in the premises of the Kontaktstelle Wohnen in the Georg-Schwarz-Straße 19 from December 2017 until February 2018. Weekly we met for joint exchange, cooking and playing. 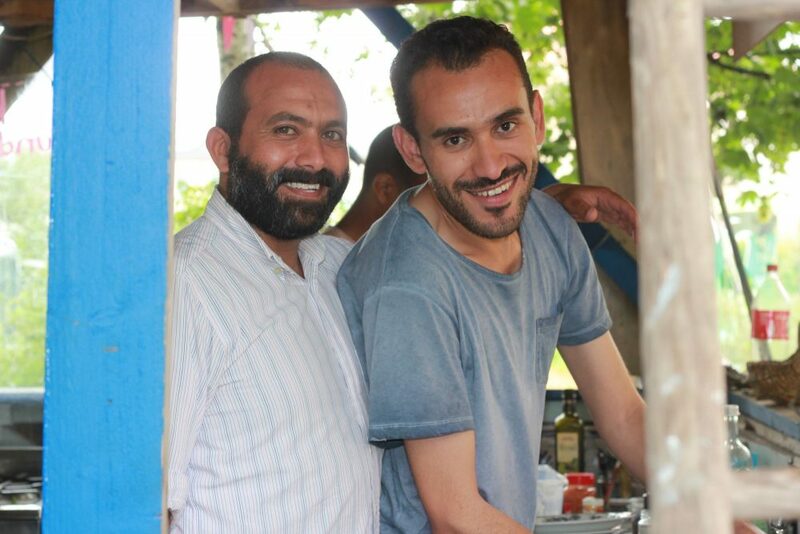 Furthermore, together with the participants, we organised exciting events and workshops and as the garden work ceased we were able to concentrate on other important issues like work & education, cultural & artistic interests and the personal exchange of experiences. Thereby, we pursued especially topics which were particularly relevant and exciting for the participants. 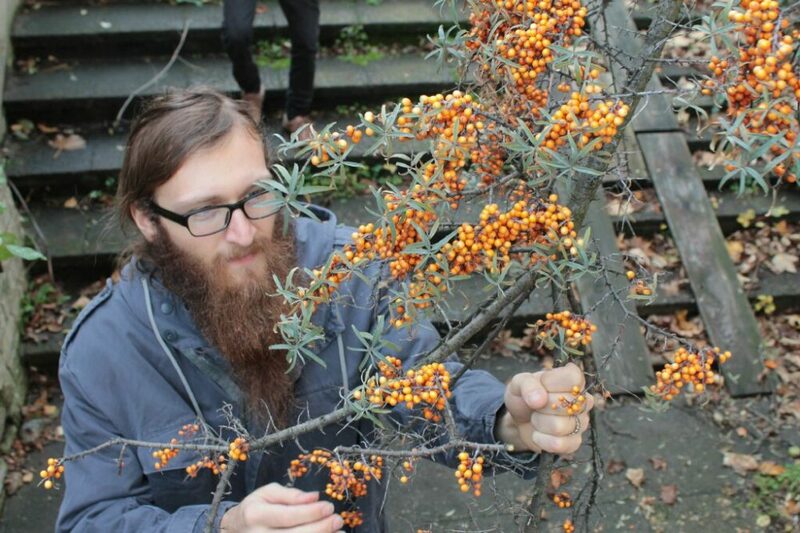 For example, we practised writing applications, visited a garden- and landscaping operation, organised readings of Arabic poetries and learned a method from Georgia to tap birch juice. 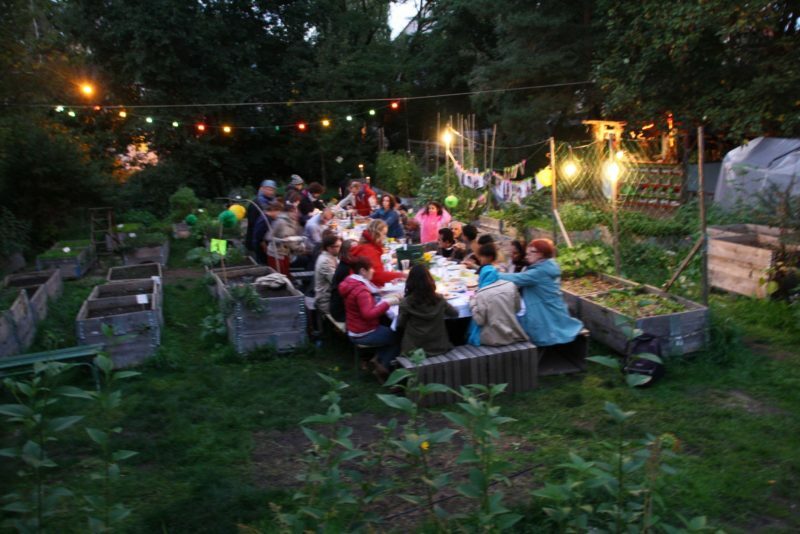 With a brilliant season prelude in April, we started, together with the remaining garden community into the garden season 2018. Consequently, we were able to be pleased with many wonderful garden hours, exciting workshops and great meetings. A review of the past two years you find here (in German). 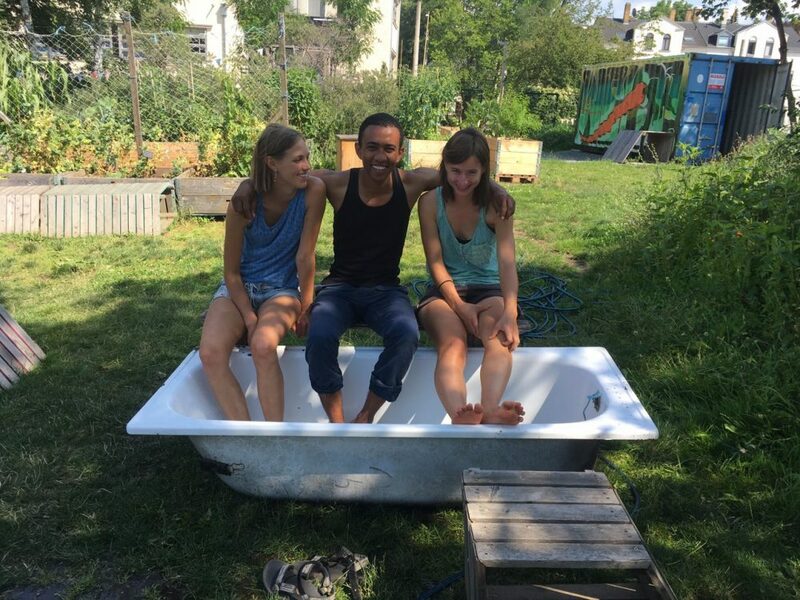 Always Thursdays from 12:00 until 19:00 you were able to find us in the community garden in the Zschocherchestraße and were happy about seeing old and new faces! We’re pleased with another year of ESF-aid! In September 2018 we started in the second funding period of the ESF-project. 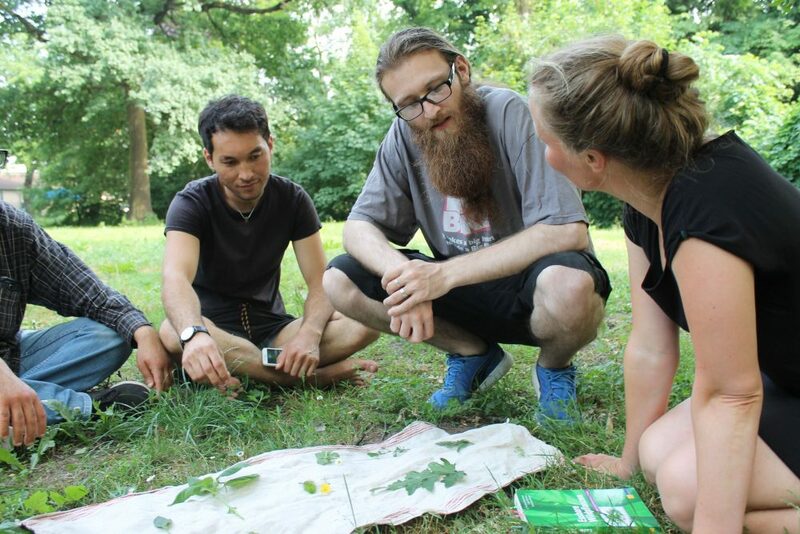 Additional to the garden dates or rather the winter meeting as well as the workshops we offer a third project component, the „consultation hours support network“(„Sprechstunde Unterstützungsnetzwerk“).